A status meeting — sometimes called a stand-up — is a meeting where a bunch of people get together in a room (or virtually via video chat) and speak one at a time. Someone gets the floor, they fill the group in on something that’s going on, then they cede the floor to someone else who does the same thing. One after another, around they go. Here at Basecamp, the Automatic Check-in tool takes the place of weekly status/stand-up meetings and daily status updates. 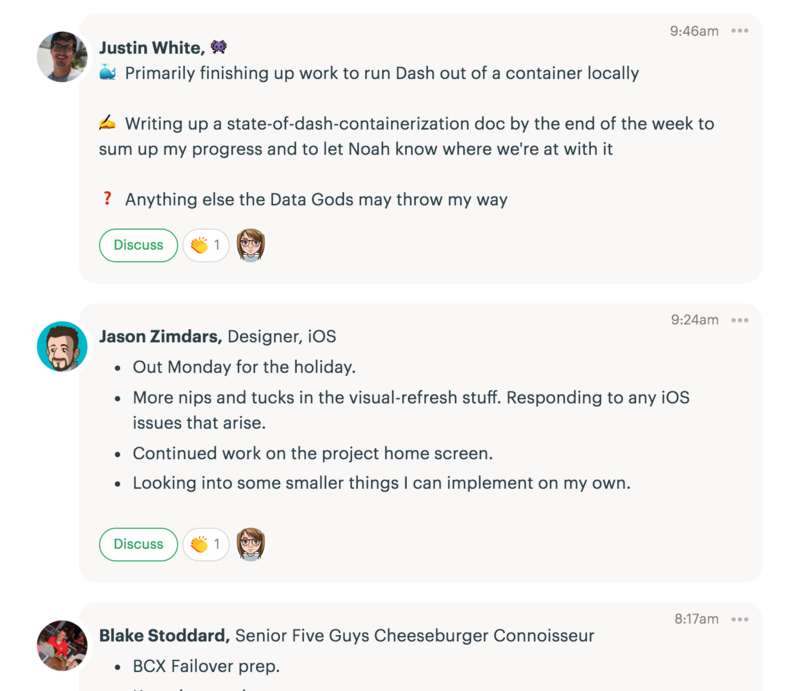 We communicate a ton of detail about what’s going on across the company without ever having to pull someone away from their work and into a physical or chat room. 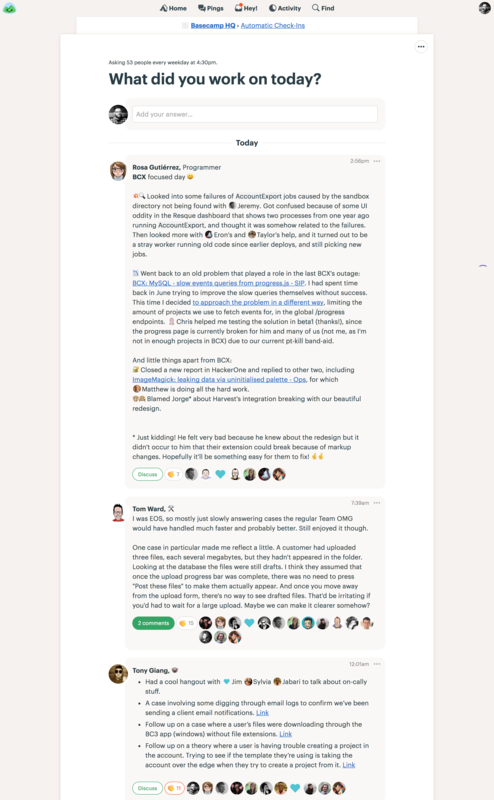 Daily at 5pm, Basecamp automatically asks everyone our company, “What did you work on today?” And when people have a free moment, they post their answer. The answers are visible to everyone in the company, so everyone knows what’s happening without having to follow dozens of separate projects or conversations. 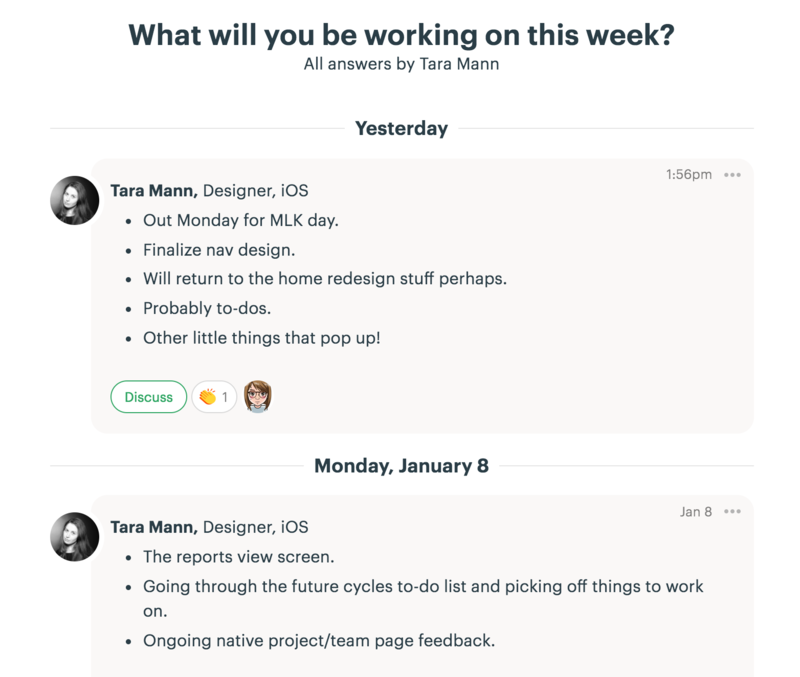 Here are some answers to “What do you plan on working on this week?”. It’s easy to eliminate meetings and regain a bunch of time. Start knocking out one meeting a month. See how it goes. Then one a week, and so on. Ease into it and you’ll see the benefits mount. Soon enough you won’t look back.